The Western Gangas ruled over a large swathe of territory in Karnataka in south-western India. Despite this large area of territory, the kingdom itself was a relatively small one (in the context of the Indian sub-continent, at least). The kingdom was known to the Gangas themselves as Gangavadi, and was centred around modern Mysore, in the far south of today's Karnataka state). This location probably made them neighbours of the Cheras to their south, although this is somewhat questionable as the Cheras themselves seem largely to have been confined farther to the south in modern Kerala state, except perhaps at the height of their power in the first century AD. The more powerful Pallavas were located immediately to the east. Opinion is divided about the heritage of the Gangas, with some referring to them as being Suryavanshi Kshatriyas while others claim them as Kanvayana Brahmins. 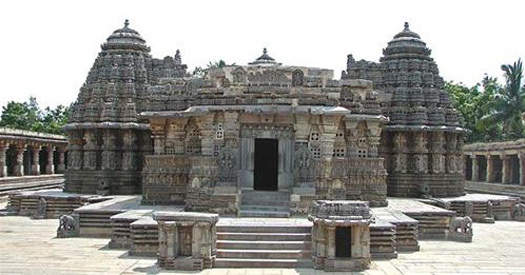 Ganga architecture at Shravanbelagola and Kambadahalli is very famous, notably in the Jain basadis (temples) which include the Chavundarya basadi at Chandragiri Hill, and the Panchakuta basadi at Kambadahalli. The Gangas also built beautiful Hindu temples such as the Kapileswara temple at Manne, the Kolaramma temple at Kolar, the Kallesvara temple at Aralaguppe, the Maralesvara temple at Tallakad, the Arakesvara temple at Hole Alur, the Narayanswami temple at Nanjangud, and the Sattur, Hangala and Patalesvara temples. The early Gangas followed Vedic Brahmanism, but were tolerant of Vaishanavism and Jainism. 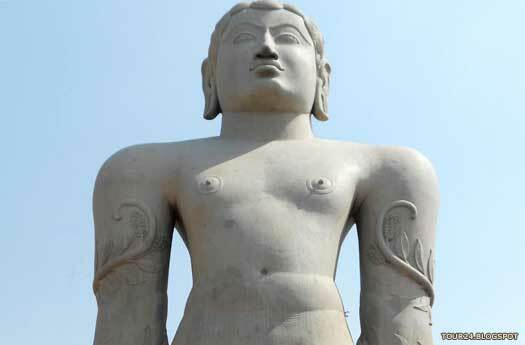 Shaivism was also largely followed, but the later Gangas converted to Jainism. Their culture was largely based on agriculture, with popular crops being cultivated including sugarcane, coconut, betel leaves, paddy, spices, flowers, and probably others. According to some scholars, the Gangas lived on the bank of the Ganges, which of course is absolutely nowhere near Karnataka so perhaps they originated in the north and migrated southwards (following the Indo-European arrival?). One Muru Kaoya is claimed as the founder of their dynasty of kings, but this is yet another obscure name in a kingdom that contains many obscure names. It is more likely that he was a revered ancestor whom the Gangas regarded as their founder figure in terms of their tribe or people. The Eastern Gangas of Orissa are often claimed as an offshoot of the Western Gangas, although opinion over this seems to be divided down the middle. They appeared while the Western Gangas were relatively powerful, but seem not to have flourished themselves until the end of the ninth century. Orissa is a great deal removed from Mysore, far to the north-east and abutting West Bengal. If they were indeed related then it must have been a relationship that was severed when (if) the Western Gangas migrated southwards at an unknown date before the Western Ganga kingdom emerged. However, opponents to this theory point to epigraphical evidence that supports a southern origin for all Gangas, so it seems likely that the Eastern Gangas proceeded northwards from Mysore to found their own kingdom. Regional chieftain? Made Kolar his capital. Vishnugopa of the Pallava kingdom comes in conflict with the great Gupta king, Samudragupta, and is defeated. Despite this, around this time the Pallavas count the Western Gangas as their vassals. 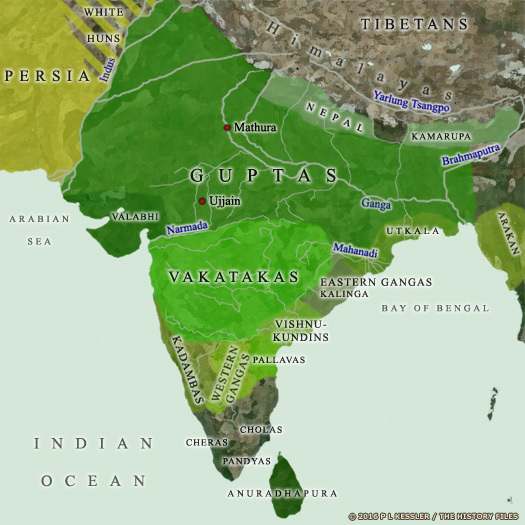 However, the disruption caused by Samudragupta's various campaigns possibly leads to the emergence of several tribes as minor regional kingdoms in their own right, especially in the more distant south. It seems likely that the Western Gangas now begin to carve out a small but prominent kingdom of their own, as do the Kadambas of Banavasi (in coastal Karnataka). Founder of the dynasty. Capital at Kolar. Not on all lists. By this time the Gangas have consolidated their kingdom, although they have seemingly remained vassals of the Pallavas (and certainly are so for the century and-a-half). The next king, Harivarman, moves the capital from Kolar to Talakad (giving the dynasty another name to be known by - the Gangas of Talakad). Pallava vassal. Moved capital to Talakad nr Sivasamudram, Kaveri. Pallava vassal. Followed the Jain religion. 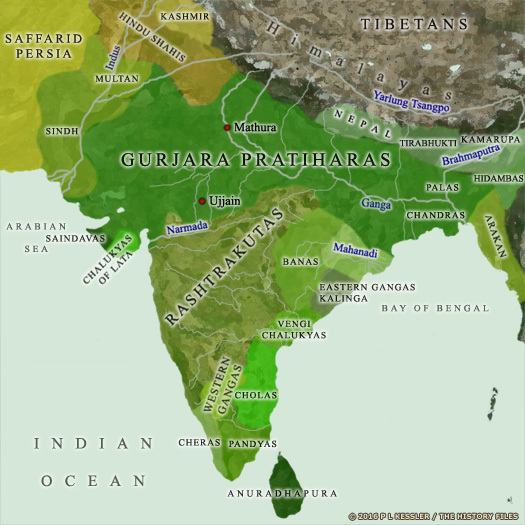 The late fifth century is when the kingdom of the Eastern Gangas first appears in Kalinga. A chieftain by the name of Indravarma (actually shown as Adhiraja on the Godavari plates) unites with other chieftains to defeat the Vishnukundin ruler, Indrabhattaraka - occupier of southern Kalinga. A notable fighting method employed by Indravarman which makes mention of him recognisable in more than one source is the use of 'four-tusked' elephants, although this is fairly conventional anyway. Then he establishes his own expanded kingdom. Kalinganagara (better known today as the village of Mukhalingam in northern Andhra Pradesh) becomes his capital, while Dantapura serves as the kingdom's second city. Avinita's two sons go to war over the succession. The younger of them, Durrvinita, defeats their father's preferred choice and ascends the throne. The name of the preferred candidate doesn't seem to be known, and neither does his ultimate fate. Son. Defeated his brother in civil war. Durvinita declares independence from the Tamilian Pallavas after the latter's hold over southern India weakens. He subsequently conquers Punnad (southern Mysore) and Kongudesa, and maintains friendly relations with the Chalukyas (his accepted overlords) by marrying off his daughter to the Chalukya clan (either to Vijayaditya or Pulakeshi II) after their political rise in the Karnatak region. Unfortunately his successors appear to be weak and ineffectual. Some of them seem not to be mentioned in all sources, suggesting a kingdom that becomes isolated for a time, perhaps with borders that shrink. At one point (at least) the kingdom may even be divided, with rival regional claimants to the throne (witness the two barely-known names in the late seventh century, for example). Not on Gangas of Talkad list. Immediately following Bhuvikarma, the Regents of Nations list shows two names that seem to be mentioned nowhere else. It is possible that they rule briefly as kings, but perhaps it is also possible that they are sub-kings, regents, or prominent members of the royal family, and that the unexpected gap in the more recognised chronology that they introduce is not really a gap at all. Only on the Regents of Nations list. Patronised Jainism and set up several Jain basadis. The kingdom is resurgent in this period. Shripurusha loses Kongudesha to the Pandyas and accepts their overlordship, but he does win a victory over Nandivarman II of the Pallavas. During his reign he also faces several Rashtrakuta invasions, after they overthrow their former masters, the Chalukyas of Badami, and become the dominant power in the north. During his reign he transfers his capital to Manyapura (Manne near Bangalore/ Bengaluru, a fairly short way by India's standards) to the north-east of the Mysore region, and farther away from being in reach of the coast). He assumes the title 'Kongini rajadhiraja parameswara' and his prosperous kingdom comes to be known as Srirajya. The Nolambas of Nolambavadi (in the Chitaldurg district) acknowledge his overlordship. Following the death of Shripurusha, the kingdom enjoys fluctuating fortunes. Shivamara is defeated and twice imprisoned by the Rashtrakuta kings, Dhruva and Govinda III. Clearly a vassal of theirs, Shivamara revolts again during the reign of Rashtrakuta king Amoghavarsha and maintains his independence until his death, always fighting off the Rashtrakutas who are dominant to the north. Rachamalla also declares his independence from the Rashtrakutas, putting in doubt any claims of true independence for the kingdom. It seems more likely that the Western Gangas are generally regarded by the Rashtrakutas as vassals, and each Ganga king must assert his own individual independence from that status. Quite naturally under these circumstances, warfare against the Rashtrakutas continues. Perhaps the Ganga spirit of fighting against their vassal status has at last had an effect. Seeing the futility of waging war against the Western Gangas, the Rashtrakuta king, Amoghavarsha I, gives his daughter Chandrabbalabbe in marriage to Ganga Prince Butuga I, son of the king. Butuga is otherwise very obscure and seems not to succeed his father as king. He may be the same person as the Prithivipatri I mentioned by the Gangas of Talkad. Likewise, the succeeding Prithivipatris are also obscure, suggesting either non-ruling nobles, or sub-kings. Butuga I / Prithivipati I ? Son. Possibly also Prithivipati (Gangas of Talkad)? The Eastern Gangas emerge in Orissa. They are claimed as an offshoot of the main Ganga line, but it is hard to see how they can emerge at the other end of the sub-continent unless they have remained in that region after a proposed migration southwards by the Western Gangas at some point before their kingdom had emerged into history in the fourth century AD. In return for helping the Rashtrakutas in their wars against the Cholas, and the Pallavas in their wars against the Pandyas, Butuga is pronounced king by the Rashtrakutas. However, this cannot possibly be the Butuga who had been married to a Rashtrakuta princess in the middle of the ninth century or he would be at least a century old by the time of his death. Therefore this is Butuga II. The king's general, Chamundaraja (or Chavandaraja), builds a huge monolith statue of Gomateshwara (or Gomtesvara) in Shravanbelagola (or Sravana Belagola). 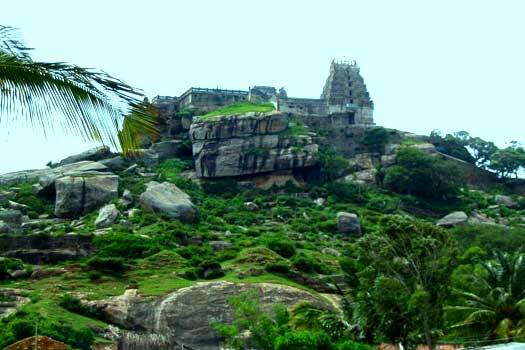 This is located in Channarayapatna, Karnataka's Hassan district, some 158 kilometres from Bangalore, the kingdom's capital. The date of its construction is somewhat conjectural, with the earliest inscriptions on its base being dated to AD 981, while the site itself has been important in Jainism since the fifth century. At an unknown date Butuga becomes the son-in-law of Amoghavarsha III of the Rashtrakutas by marrying his daughter, Revakanimmadi (presumably before the Rashtrakuta king dies in 939). Now, in 949, Butuga helps the Rashtrakutas to defeat the Cholas at the Battle of Takkolam, where his arrow strikes and kills the Chola monarch, Rajaditya. As a Rashtrakuta vassal (confirming the supposition, above, that the kingdom is generally a vassal state with only individual kings asserting their independence), he not only rules Gangavadi but also many areas in the Malaprabha river basin and the River Krishna-Tungabhadra doab. With his immense contribution to the Rashtrakuta victory over the Cholas, Butuga also takes charge of the Banavasi region as a fief from his brother-in-law, Rashtrakuta King Krishna III. Only mentioned in Regents... so possibly a sub-king or prince. The Regents of Nations list is the only one to show Pancala Deva, so the natural inclination is to dismiss him as another possible regional sub-king or prominent noble who does not rule. However, the date of 974 given by Regents... is intriguing. Could he instead be a short-lived successor to Narasimha, a regent for Rachamalla, or a would-be usurper? Not in Regents... Last Western Ganga king. The Cholas under Rajaraja Chola I capture Talakad and force the Gangas to accept their overlordship (AD 1004 is an alternative date for this event). It is likely that Neetimarga is either killed during the invasion or is removed at a later date, ending the greater Western Ganga kingdom. The devastating defeat begins a decline of Western Ganga authority until they fade away entirely. The Eastern Gangas, also obscure during this period, are soon revitalised to create a new Ganga kingdom in the Orissa region of India. The suggestion here is that the kingdom itself is terminated but Ganga nobles are still selected to perform the role of entirely subservient vassal rulers for the region under Chola overlordship (for a century). The Ganga name fades from use in time and other kingdoms replace them in the region, such as the Hoysala kingdom. Records for these lesser Ganga vassals are unavailable, and are probably also unnecessary.